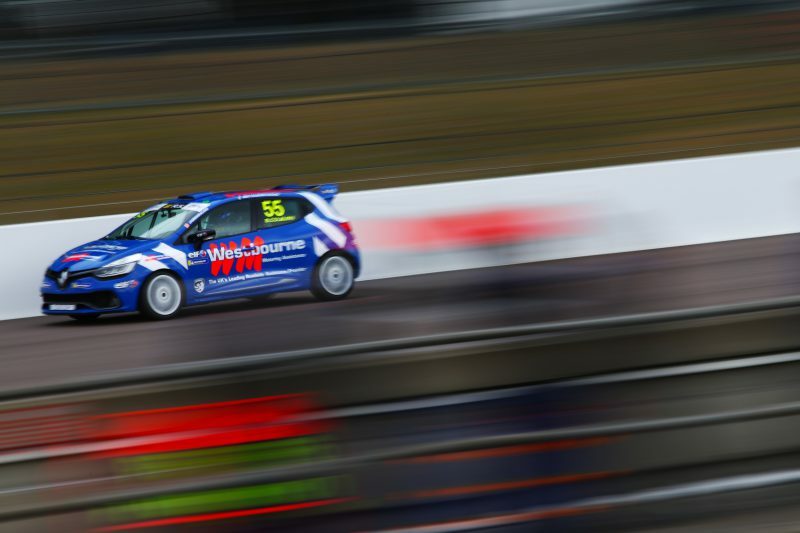 Westbourne Motorsport kept themselves in the hunt for honours with a strong points haul as the Renault UK Clio Cup action resumed at Rockingham Motor Speedway last weekend [11-12 August]. With four pole positions, five race victories and eight podium finishes already to their record in 2018, the Worthing-based outfit arrived in Northamptonshire aiming to extend their recent run of form, with BRDC Rising Star James Dorlin also still in contention for the Drivers’ title. With all three cars qualifying in the front six rows of a hotly-contested qualifying session, only misfortune prevented the Vantage Motor Group and GardX Protection-backed squad from adding to their tally of silverware. Dorlin made the perfect start from the second row and briefly took the lead heading through the ultra-fast banking at Turn 1, only to concede on the outside line into Deene Hairpin and later be pushed off and onto the grass with contact from behind. James Colburn, meanwhile, moved superbly through the field in the opening laps into fourth, and spent the majority of the race hounding series stalwart Paul Rivett, then later Jack McCarthy, for the final podium spot, though he would be denied by seven tenths of a second. Contact in a closely-fought field hampered Ben Colburn’s opening race, but the Michelin Clio Cup Series ace proved yet again why he is one to watch, fending off ex-British Touring Car Championship racers Andrew Wilmot and Nic Hamilton among others to take 15th on the road. That proved to be the high point for Ben, with contact from another competitor into Deene Hairpin in the final, ITV4-televised race forcing him into retirement on the spot with a heavily damaged car. Colburn and Dorlin, meanwhile, took 11th and 12th to add to the team’s points tally. The championship fight resumes in mid-September at Silverstone – the ‘Home of British Motorsport‘ – with Westbourne still in the hunt for a maiden Renault UK Clio Cup title. James Colburn (#7) said, “It’s been a very mixed weekend. The opening race was a fantastic return to form at the top of the timesheets – where we should be! “The tyres went off in race two and front end grip was a struggle, but we head to the next round at Silverstone aiming for strong results, both personally and as a team. James Dorlin (#32) said, “It’s been a tough weekend but we have time on our side and we’re still in the championship hunt. Ben Colburn (#55) said, “A tough weekend for me, but one with a lot of lessons learnt that I can take into the remainder of the season. It was great to be right on the pace in qualifying, and to demonstrate that I’ve got the outright speed to be competitive.